Everything that has ever gone wrong on a construction project is a potential risk on the next project. Many project managers instinctively develop a lessons-learned list of historical risks and take steps to minimize their exposure to those risks in the future. 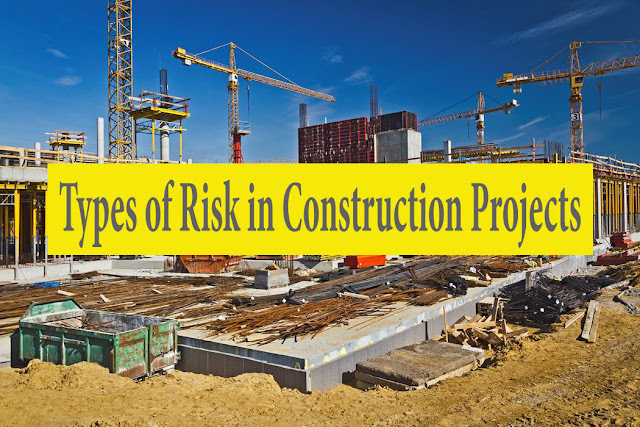 Risks vary by industry and even by construction project type as well as by personnel involved with the project. A roadway or bridge project has a different group of risks than a facility or building, and the selected contractors may have different degrees of influence on the level of risks to performance. If an owner attempts to save money in preconstruction services by limiting the extent of field investigation or development of as-built data, there will be a higher risk of discovery of unknown problems. The experience and competence of the architects and engineers handling the design of the project, as well as their quality control in development of working drawings, directly affect the construction effort and, consequently, the risk associated with the plans and specifications. Even if the owner has been proactive in preconstruction investigation, there is always a risk of unforeseen conditions. This can be a function of the type of soils encountered, the local municipality, and its culture and history of keeping good records of obsolete utilities. If the city in which the project is to be built has a history of requiring contractors to remove all abandoned underground lines, there is a much lower risk of underground conflicts. The selection of the project team can impact positively or negatively the probability of successful project completion. Design-bid-build projects that use procurement philosophies allowing all financially capable contractors to participate will likely experience a much higher level of risk to on-time performance than a procurement philosophy that requires qualification of proposed contractors to ensure that they have the appropriate experience and resources to construct the project. A single weak subcontractor on a project will increase risk of performance and require more management than may be anticipated. If this is not considered, everyone will be surprised when that subcontractor fails and has to have their work augmented or corrected. Problems related to the management and possible termination of a failing subcontractor usually has serious negative impacts on the project. The reputation of the construction manager (CM) as well as the corporate culture will affect project performance. If the CM defines success with minimum time extensions as the only benchmark, there will likely be more conflict and a higher need for dispute resolution efforts. In addition, the management abilities of the CM directly affect many project tasks, such as review of shop drawings and response to requests for information in order to resolve questions about the construction. Work by outside or third parties can carry significant risks of influence on the project’s success. For example, a light rail station to be built on top of a parking garage under construction by a different contractor will run an increased risk of completion on time. The project has no control over—and little ability to influence—the completion of the parking garage, which quickly becomes vital to completion of the light rail project. Most projects are affected by local weather conditions, which, when adverse, can significantly impede progress. Most specifications require the contractor to take into account the normal local weather conditions in his schedule planning, which includes normal adverse weather but also allow for time extensions when unusually adverse weather occurs. Best practices would require the contractor to research the local historical weather records in order to plan for three to five-year average weather conditions. Different parts of the country and the world have a wide variance in weather conditions, so planning or failure to plan for the risk of local weather can significantly affect project success. Local political situations, especially in volatile political climates, may hamper all efforts to construct a project efficiently. Countries with unstable political or economic systems will have higher risks in successful project completion than those with more stable systems. Countries or regions subject to wars, terrorism, turmoil, or other types of violence also run greater risks to successful project completion than others. If the locality has a policy of requiring deep investigation into environmental issues or stringent or complicated bureaucracy, projects built in that locality will have a higher risk of late permits and conflict during construction. Another large risk on any project is the experience and reputation of the project team for safe construction practices. Safety violations and accidents can shut down a job completely. Even minor safety failures can distract the project team and impede timely performance. If a contractor has a poor safety record, the risk of delays because of safety violations is increased and should be taken into account during schedule development. A large volume of change orders on a project will affect employee morale; there is nothing worse than asking a craftsman to rip out recently installed high-quality woodwork for a requested change. If the CM has a good change management program in place, including and most importantly good planning, the risks of negative pressure from changes are lowered. Without the program, the risks may be significant enough to derail project completion. Most conversations about risk are related to negative risks that impair successful performance, but often there are opportunities that would be overlooked without a good risk assessment. A renovation project that calls for a three-story masonry wall to be demolished to the foundation in order to install a beam and column system might be redesigned with a pin beam temporary support structure, allowing the upper two stories to remain in place, saving time and money, as well as removing some risk. The brainstorming about risks needs to include looking for opportunities that could positively impact the project time for completion. It seems obvious that failure to plan for the myriad of risks that often affect project performance will render the planning less accurate. Without risk management, every item that might appear on a risk register (a checklist of potential risks) is a surprise to the project team should it happen, diverting attention and emphasis from the project management and consuming valuable resources. Most disputes arise from risks that likely were not considered at the inception of the project and might have been eliminated or mitigated with good risk planning. Once a company develops a regular risk management culture, the risk register generates many of the same risks on project after project. However, a company’s ‘‘risk register’’ should not be a fixed template, used as is on all its projects. The list must be updated and customized for each project taking into consideration its own risks. These lessons learned, when incorporated into the project schedule through the risk management program, are invaluable in helping to minimize threats that carry negative impacts and take advantage of opportunities that bring positive impacts to project completion.